Dolmen du Pech-Laglayre (or Laglaire) is the generic name of 3 dolmens in the municipality of Gréalou, north of the beautiful Lot Valley. In the Occitan language, Pech means flat promontory/plateau; you’ll therefore find them on the hills overlooking the village, along a section (GR65) of the Way of St. James. 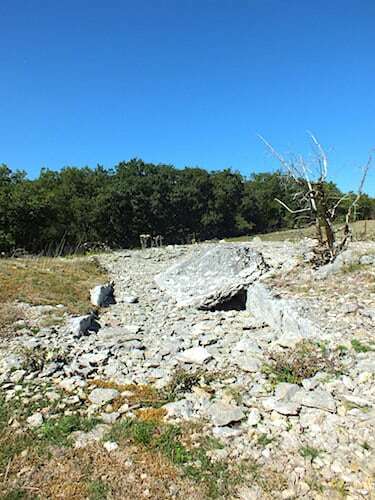 These dolmens, scattered 200m from each other, are also known as Dolmens du Mas-de-Pégouriès, after the neighbouring hamlet. 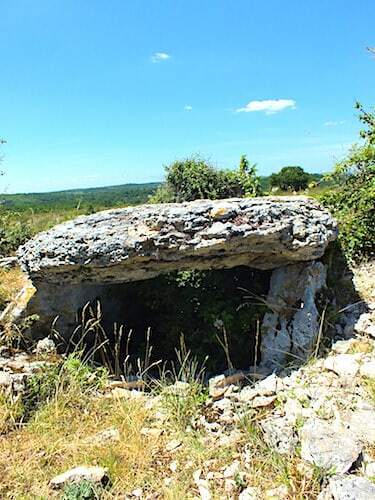 Two dolmens (no1 and no2) are in good condition and were listed historical monuments in 1978. UNESCO listed the most complete of the two (dolmen no2) as a World Heritage Site in 1998. 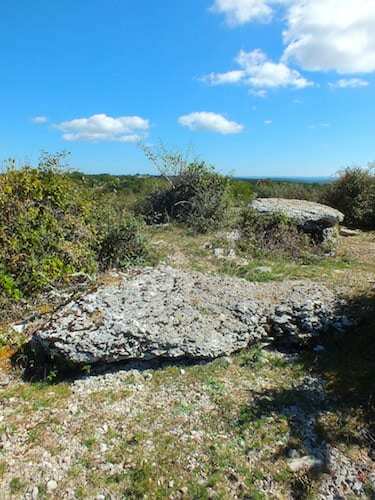 The first dolmen is hidden in the vegetation, at the highest point of the pech; you can’t miss the second, as it stands along the GR65, near a pilgrim stone cross, but the third, on the plateau, is alas very damaged. Located at the highest point of the pech, it once stood within an oval tumulus. Well camouflaged among the bushes, it was originally a double structure; the small dolmen is still in good condition, but the large dolmen is quite dilapidated. The small dolmen’s sepulchral chamber is inaccessible, as the cover slab is very low, but also because brambles and bushes have grown inside. The large dolmen's sepulchral chamber is buried, and the two cover slabs fell ages ago and lie on their side. This dolmen stands at the edge of the road, completely cleared of vegetation, and was straightened during restoration work in 2013. It indeed suffered time and weather damage over the millennia, but also pilgrims’ involuntary degradation as they used it as temporary shelter. Experts worked out that the cover slab’ weighs 7 tons! They've also established that the sepulchral chamber was quadrangular, but think that the tumulus could have been quadrangular or trapezoidal with 10m long sides. The slab that closed the western side of the sepulchral chamber is still in place and therefore limited access to looters. Part of the funerary furniture discovered during the 2013 excavations is exhibited in the Cahors Museum. It included 114 shell beads, 2 shiny black lignite stone and 11 calcite annular beads, a grooved bone pearl, a pointed pearl, a perforated shell, a broken arrowhead and a pendant made from a flat pebble. This is the least preserved of the three, as only few vestiges are left, but the 17m circular tumulus is still quite well visible. The stones that supported the dolmen are still standing, however, buried inside the tumulus; the cover slab lies on the side, the closing slabs are gone and the sepulchral chamber is full of rubble.